Later in the 20s, my grandfather came to work (second generation). He was very artistic and a very well accomplished musician. He did a lot of things. He would dress department store windows for the different holidays. He won several trophies for best window design from back in the early 20s. He was a pilot and enjoyed flying. He would actually wing walk. Stores would actually pay him to throw flyers out from the plane over main street for sales events. My father came to work for the company. He would miss school to drive his great-grandfather to visit a customer or deliver a set of uniforms – whatever needed to be done. He missed a lot of school the last few years of high school. After HS, he joined the Navy and went into college with the Navy. He was set out to sea for World War II as a signalman. He was a very accomplished trumpet player. Came back after WWII and played jazz bands at night and made band uniforms during the day. After that, came Kenneth and myself (Richard). When was the transition made where Fruhauf uniforms became focusing solely on uniforms? It was with my great-grandfather in 1910. He left the department stores and started Fruhauf Southwest Garment Company. Renamed in the 40s to Fruhauf Uniforms. Each generation has started from the ground floor up, pushing a broom, working in every single department in the building. Work as traveling salesmen on a commission basis. We learned how to run the business, how to build a quality uniform, and how to give superior service to our customers. Both Ken and myself had the pleasure of working with our father and our grandfather. My father worked his father and grandfather. Not just a father son thing or brother-brother, we worked with 3 generations together over a period of time. That was a tremendous education for us in working with them and using their knowledge/expertise to learn from (their values). All of the things it takes to run a company and to give your customer quality products and superior service. If you don’t understand your customers, then what are you doing. You have to understand them – what their wants are, what their needs are, and you have to do anything and everything possible to meet/exceed those needs. Is there a fifth generation working? Yes, there is a fifth generation. My oldest is 15 and I have a 12 year old. Kenny’s oldest is 27 and his daughter is 20. Are they working/interested in the company? Well, actually my son had a snow day today, so I woke him up and asked him if he wanted to go to work with me. He’s actually sitting right here. Growing up and working for your father and grandfather, it was not easy. We were expected to do more than expectations. We had to earn our respect. We were expected to do twice as much to get half the distance. We had to succeed. If we didn’t, we had to try again until we did. It took a long time to get to that point. My grandfather always told me, “be patient, your time will come.” And with each generation, their time does come at some point. You have to be patient and you have to step back, look at the big picture, evaluate what’s going on, and then generally understand real quick that you’re not there yet. You just relax, don’t worry about it, and just take care of business. Take care of the customer and exceed expectations. How do you understand what the customer’s needs are? Firstly, you have to listen to them. You have to listen and understand what they’re saying. When they’re telling you they need a certain type of garment to do a certain type of thing, you try and figure out a way to get it done. Kenneth: When we’re dealing with Jim Sada at Southwest Decad HS, his uniforms are totally different than Alfred Watkins at Laseder. Both of them do a totally different marching concept and their shows are totally different. Florida A&M University is totally different than Ohio State, as is the University of Texas is totally different than UofM. Each one of our customers have tradition that needs to be adhered to. Other schools would like to have an entirely new concept. We deal with a lot of schools that are brand new (just opening up). We’re developing logos and a tradition even before it actually happens. We’re developing color combinations with them, in addition to logo and artwork (designing mascots and also what the band logo is going to look like). Everybody wants to be very unique. It’s more than just providing a garment to wear on the field, it’s providing them an identity. We’re providing them with a sight and color, a concept of what they want to see on the field, how they want to see their colors used on the field, how progressive of a design, or how traditional of a design – every school is different. With a new school, we’re starting a new tradition – we’re creating what will become that school’s tradition. That must be a real sense of pride to be in that position when all that comes together. Most definitely. It’s just fantastic to see that happen. We’ve done logos and things for schools where the whole school has taken over that logo. We’ve done logos for schools where even the town has taken over the logo. We do take a tremendous amount of pride in what we do. We enjoy what we do. We enjoy the products we make. We enjoy our customers. We enjoy making the highest quality product in the industry and giving that customer what they need. When you’ve done that, you can sleep well at night. To be able to last 100 years is an incredible feat. Kenneth: We deal with customers all the time that we see at trade shows and so forth in many different avenues, and they’ve been working with another company. The other companies can sometimes just send them images that aren’t really appealing to them, and every time the customer goes back to try to change things, it’s done with resistance by the company. Our sales reps and graphics team greets all customers and their requests with enthusiasm and have created a line of communication where the customer and us work together. The open line of communication and the ability to work together has been very well accepted. What are some of the new challenges Fruhauf or even director’s face? Kenneth: Well we’re constantly developing new ways of manufacturing to meet the ever-demanding requirement of building a stronger, better garment, but keeping it lighter. Everybody wants a very light uniform, but there are only a certain amount of supplies that can be put into the garment. If the customer wants the garment to be so lightweight, there’s a certain amount of integrity that will be compromised between lightweight and durability. So we’re constantly being challenged with that. Also, we’re being challenged with different ways of cleaning the garment (dry clean or wash) and what kinds of materials we use in that garment to be used in either both scenarios, or one depending on what the requirement is of the client. Also, having the garment to be very flexible and also the ability to adjust sleeve length, trouser length, waist length, and so forth so that there’s very little sewing that would go into the garment for adjustment. The use of snap adjustment has become very popular. Richard: Along with also leaving alteration room on the garment, so that as the customer, they can make a simple alteration to the garment and now fit their student without having to go and buy a new uniform. We put alteration room in all our products (the pants, the coats) so that the customer can make those minor adjustments, very cost effectively and not be stuck in buying another uniform. We feel if we give the customer some flexibility in the product, in turn we have a better customer by taking care of their needs and satisfying any issues in their design and function so the uniform works best for them in their school, their climate, and with their students. For band director’s out there that are considering new uniforms, what’s the best advice that we can give them to keep tradition, but move to a new look? Sometimes, an updated look is a copy of somebody else. We don’t want to do that. We don’t want to “cookie cut” designs. In our designing and our engineering, we want to be a step above and pushing the envelope so we can give that customer something unique. It doesn’t set any individuality when a band goes to a competition and sees all the other bands looking alike just with different colors. We want to take their colors, their mascots, their traditions, their likes and create something that’s unique but still meet with their traditions and what they need for the type of marching they do. If you’re in a cor-style band, there are things that are done differently compared to a show-style band. Each band has it’s own requirements. We make a garment that is going to meet and exceed those requirements. We make a garment that will look just as good the last day they wear it as it did the first day they wore it. We don’t want to just make a uniform, ship it, and say “here you go you’re done.” We provide service after the garment is done; we’re there to take care of their needs – if it’s one button or another 25 uniforms. Who gets involved with ordering the garments? Is it the band director or boosters? It depends on the school and the program and how it’s structured. A lot of times we’re dealing with booster groups, but we’re also dealing with purchasing agents – every school system is different, every customer is different. When customers come visit our factory, they see the dedication of all of our employees. We would not have the product we have if it wasn’t for our employees. They are one of our greatest assets. They take pride in their garments. They love seeing them in parades and going to football games. They love seeing the kids happy and having a good time. I would say right now, our average employee has close to 20 years experience. We have very few people that are under 5 years. We have a few in the 25-35 year range. Our record so far is a lady who worked for us for 50 years. She actually worked with all four generations. We treat our employees right, and they treat us right. It shows when you see how we do it, we get everybody involved. When I’m sitting there with a customer, I’m going to get my coat supervisor to ask the best way to construct something or it might be our design department. We have four-five people here that are able to do computer designing. They all have great ideas in their design. We all design things a little bit different. Our equipment – we continue to reinvent back into the company. We have implemented electronic marking and cutting systems (25 years ago). We have implemented new and updated embroidery and sewing machines. We have gotten state-of-the-art electronically assisted sewing machines. Computer based machines where it knows exactly where to stop or whether the needle is in the up position or the down position. We have a lot of state-of-the-art machines that helps the operator be more efficient in their job. When they’re more efficient in their job, they are able to produce a better product. We are always trying to find a better way of doing something. When we’re looking at our product and when we’re evaluating our product and the types of things that go into it, we are not necessarily looking for what is the cheapest – we’re looking for what is the best and what is the best for our customers. If it costs a little bit more, it might be worth it because we’re able to have a product that will look better and last longer. If you’re building a product and you don’t put the correct construction behind it, you’re going to have a garment that will wear out quickly – that customer did not receive any value. We’re doing things internally here (procedural wise) that have reduced our delivery time tremendously. Our customer gets their product earlier. Generally, that makes them happy when you deliver just a little bit early. If the customer has a certain expectation of us, we want to be above that. We want all the readers to attend their state music conferences, come visit us at the booth, talk to us, and make friends. We want to see what the difference is between us and the other people out there making this product. Our doors are open. We answer our telephones. We’re here for the customer. The owners are at the music conferences so customer’s can talk directly to us. We do recognize the dedication that the music educator has in their field, without them, we wouldn’t have been able to get this far. 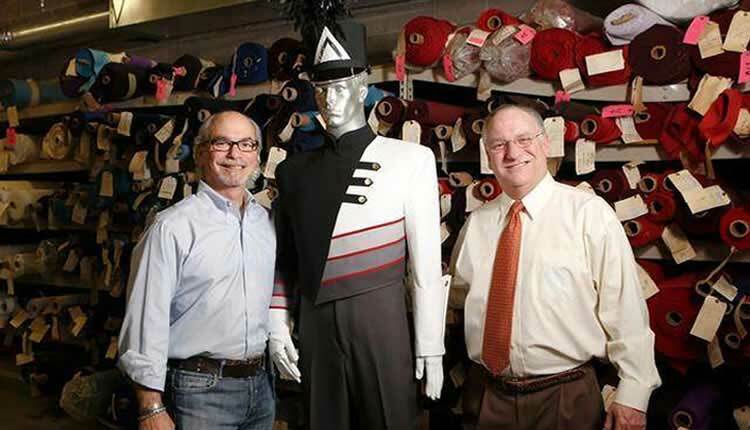 We owe everything to our customer – the band director’s of the past and the band director’s of the future. Without them, we don’t have a company. We appreciate their dedication to the job they do and to keep music alive in the schools. It’s an integral part and important part to the education of our children. For more information on Fruhauf Uniforms, click here.